Nazim Burke is a lawyer, economist, and politician from the island of Carriacou which is part of the tri island state of Grenada. He was born in Belair Carriacou as Victor Gordon Burke and changed his name to Victor Nazim Gordon Burke. He holds a Bachelors Degree (B.A. (Hons.) ) in economics from Concordia University in Canada (1980) and a Masters Degree (M.A.) in economics from the University of Windsor (1985), with special emphasis on International Development. In addition, he holds a Bachelors degree in Law (LL.B.) from the Osgoode Hall Law School of York University in Canada (1988) and completed his Masters of Laws (LL.M.) degree from Queen's University in Canada in 1994, with special emphasis on International Financial Services Law. Between 2003 and 2013, he served as an elected Member of the House of Representatives (MP) of the Parliament of Grenada. In July 2008, he was appointed the Minister of Finance, Planning, Economy, Energy and Cooperatives of Grenada, a position he held until February 2013, when there was a change of Government in Grenada. In addition, he served as the Minister of Foreign Trade of Grenada between July 2008 and July 2009. Since leaving government, Mr. Burke has co-founded the firm of Lex Fidelis Chambers, a full service law firm. His own practice focuses primarily on Corporate Commercial Law and Civil Litigation. Burke is also presently engaged as a Senior Lecturer at the Faculty of Law , Cave Hill Campus of the University of the West Indies (UWI) where he teaches Offshore Financial Law. 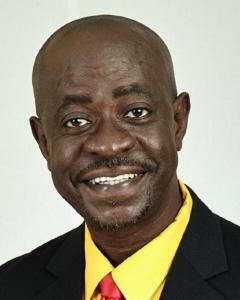 Burke is presently an Opposition Senator in the Upper House (Senate) of the Parliament of Grenada. He was elected leader of the National Democratic Party (NDP) in Febraury 2014. Burke is married and the father of two children.